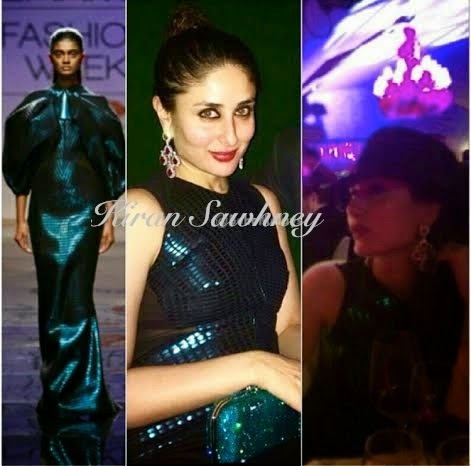 Kareena Kapoor wore a dark green Amit Aggarwal dress. She was spotted at a New Year's Eve celebration. We did not get a clearer picture of Mrs Khan in the Amit Aggarwal collection. The green gown on Kareena Kapoor as by the appearance of the original is laced in different layers. The scaled fabric of the designer wear is in one's face as it is vibrant and bright. The mixture of sheer at the tummy and sleeves seems to be a perfect combination to add more spark to the scaled effect of the gown. It is ripped from the AW 2014 collection. It also looks quite clear that Kareena Kapoor has not added in the gigantic puff like sleeves to her dress. This is the best move she made in looking this perfect. If the sleeves were attached to the gown, Kareena would have looked a lot stuffier in this ensemble. The mermaid tail style at the bottom of her gown also adds a majestic effect to the outfit. However, we are not certain if she had made changes to the bottom! From the blurry picture, Kareena Kapoor looks to be enjoying herself at the New Year's Eve celebration. She wears a round black hat, diamond earrings and minimum makeup. Red lips and a smokey eye effect have surely completed this New Year's Eve celebration style!